In early 2012, ITU-R embarked on a programme to develop “IMT for 2020 and beyond”, setting the stage for “5G” research activities that are emerging around the world. In September 2015, ITU-R has finalized its “Vision” of the “5G” mobile broadband connected society. The framework of standards for International Mobile Telecommunications (IMT), encompassing IMT-2000 and IMT-Advanced, spans the 3G and 4G industry perspectives and will continue to evolve as 5G with IMT-2020. 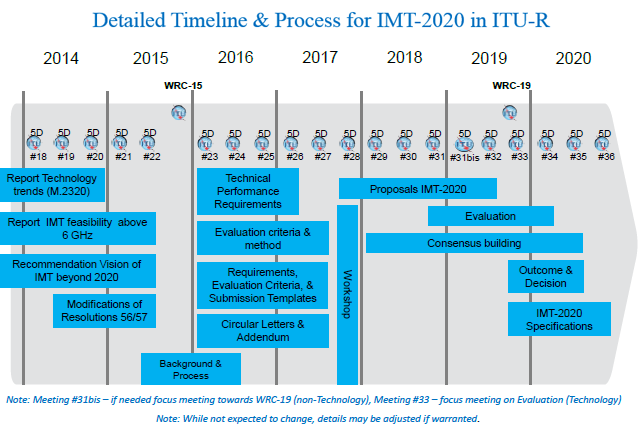 In line with ITU-R IMT-2020(“5G”) standardization process, TTA is actively participating the relevant standardization activities similar to IMT-2000(“3G”) & IMT-Advanced(“4G”) case. TTA publishes IMT-2000 standards by transposing the specifications made by 3GPP, 3GPP2 & IEEE and provides it as a reference for ITU.